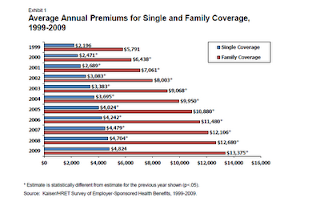 Health insurance premiums for American families continue to skyrocket. A report released by the Kaiser Family Foundation (KFF) on September 15th, reported that the average annual family premium for employer-sponsored health insurance rose to $13,375 in 2009. This represents an increase of 5.5 percent increase in premiums for families in the past year when inflation actually fell by 0.7 percent. The unrelenting upward trend in health care premiums is evident at the state level as well. Health insurance premiums are highly variable across the country, with states experiencing premium growth of between 90% to nearly 150% over the past decade. These differences lead to inequities for families and businesses as well as underlying differences in the uninsured across states. However, across all states, the rise in health insurance premiums is burdening families and threatening our economy. In every state, premiums have increased faster than wages and in every state, family budgets are consumed by an increasing share of healthcare premiums. This report looks at trends in premiums for American families over the last decade at the state and national level. Additionally, it reviews some recent actions by State Insurance Commissioners to rein in unwarranted premium increases. Over the last decade, premiums have outpaced wages and inflation by a large amount. Over this same period, wages have risen by 38 percent and inflation by 28 percent. As a result, health insurance premiums are consuming ever-increasing portions of family budgets. Health insurance premium increases are also driving up the prices of products as employers pass along their portions of premium increases and reducing the competitiveness of U.S. companies. 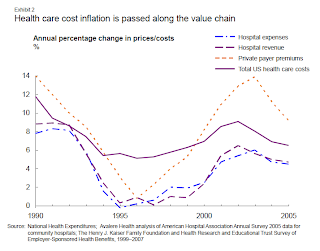 Consumers ultimately bear the brunt of costs as increases in hospital, physician, drug, and health plan spending are all passed down the value chain to American families, employers, and the government who pay the bills (Exhibit 2). According to Census data, more than 1 in 5 non-elderly adults were uninsured in 2008 and there have been massive reductions in the percent with private health insurance. 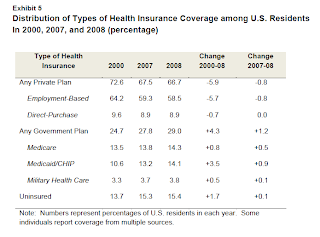 The fraction of U.S. residents with private health insurance fell by 6 percentage points from 2000 to 2008 (Exhibit 5). This imposes costs on those with coverage by increasing their premiums by a hidden tax of about $1,000. Effective health insurance regulation by State Insurance Commissioners has helped to reduce unjustified premium growth in many states; particularly in the individual and small group markets. In determining premium rates, insurers take into account prior claims experience, rising health care costs, new technologies, administrative costs, and profit margin. In some markets, ineffective competition, particularly for individuals and small groups, has led to premium increases that are unfair and unwarranted. For example, some insurers choose to under price their products to gain market share only to demand high rate increases later. Others exercise market power to increase premiums and profits. These concerns have led several states to impose rate review regulatory measures in order to make sure that insurance companies are not unfairly or excessively increasing their premiums. The following are examples of recent requests for insurance company rate hikes that were not approved by state commissioners: Maine: Anthem Blue Cross Blue Shield asked for an 18.5% premium increase in 2008, which was rejected by the State Insurance Commissioner as being “excessive and unfairly discriminatory.” The rate increase would have increased profit margins by 3%, citing recent losses on its individual products as the reason, when in fact they had gains of 5% in 2007 and 3% in 2008. Ultimately, rates were increased by 10.9%.5 Washington: Washington had a prior approval process in place from the early 1990s until 2000. It was repealed in 2000 and premiums rose steeply after that. In 2007, Regence Blue Shield hit policyholders in the individual market with as much as a 40% rate increases, even though this plan was one of 3 major insurance carriers that together netted surpluses of more than $2 billion that year. 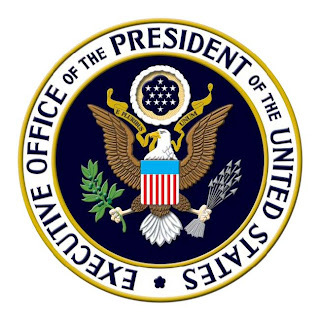 After this experience, Washington State has recently returned oversight of the individual insurance market to the Insurance Commissioner.6 Rhode Island: In 2009, Blue Cross Blue Shield of Rhode Island, Tufts Health Plan, and UnitedHealthcare requested a rate increase of 13-16%. The Commissioner told the insurers to withdraw its rate increase, stating that the increase was unaffordable for the state and would be burdensome on employers. 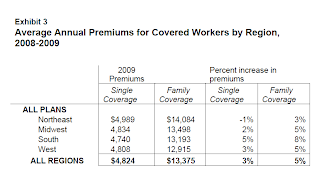 Health insurance premiums continue to rise for American families. Premiums are rising in all states and far in excess of wage growth or inflation. If we do nothing, the soaring rise of health insurance premiums will mean that millions of families and businesses will be unable to afford these increases and will lose their coverage over the coming years. For families that manage to keep their health insurance, health costs will consume an increasingly large portion of their budgets. Fair access to affordable insurance will be ensured by the elimination of individual underwriting rules. Insurance companies will not be allowed to discriminate based upon health status or gender. Additionally, insurance companies will not be allowed to charge prohibitively high prices to high-risk individuals or drop coverage if a person gets sick. Health insurance reform significantly improves the current system, in which a person who is diagnosed with a new illness can see their insurance premiums go up by as much as 50% or cancelled the following year. Insurance market reforms will further improve stability by eliminating yearly and life-time limits on how much insurance companies cover if you get sick. Together, these reforms create peace of mind and the stability and security that Americans need and deserve, especially in our current tough economic times.